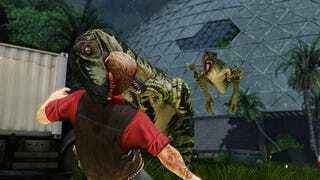 This week, the Steam Stream checks out Primal Carnage: Extinction, the latest attempt at making a multiplayer dinosaur shooter, well, not horrible. Watch now! Also on the docket for today: Battlefield-like top-down shooter Running With Rifles, permadeath horror game Space Beast Terror Fright, and the Jet Grind Radio-esque Hover: Revolt of Gamers. Soooooo maaany gaaaames.